The BP Gulf Oil Spill Help Desk discusses a proposed settlement to compensate injured Gulf oil spill response workers for damages. " In 2012 oil spill workers and volunteers were invited by the Surgeon General to enlist in a study aimed at assessing physical or mental health problems linked to the 2010 oil spill in the Gulf of Mexico. For more information about the GuLF STUDY please visit http://www.niehs.nih.gov/news/newsroom/releases/2012/may22/index.cfm. Many response workers who aided in the cleanup of the spill continue to have questions today regarding how they can receive compensation for injuries they sustained from exposure to oil and toxic chemicals used in the cleanup. 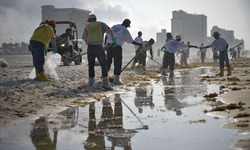 Response workers were among the only group of individuals who were directly impacted by the massive oil spill, but left out of funded groups that were eligible to receive compensation from oil giant BP, despite billions of dollars already being set aside for victims including businesses destroyed by the disaster. “As of Friday, payments have been made to more than 38,000 people and businesses for an estimated $3.7 billion. Tens of thousands more could file claims in the coming months. For more information about the BP oil spill settlement court case, please visit http://www.mercurynews.com/nation-world/ci_24449397/court-hear-arguments-bp-oil-spill-settlement. According to the BP Gulf Oil Spill Help Desk, a settlement has been proposed to help response workers who were exposed to unsafe conditions and injured as a result. The proposed settlement is still under review, and if approved, will provide compensation for qualifying injured workers for medical expenses and other damages they have incurred due to their cleanup participation. Individuals may contact the help desk today for more information about the proposed oil spill settlement and to obtain a free case review.